Social Media as a way of life particularly for the youth prompted the need for a symposium on its proper use. 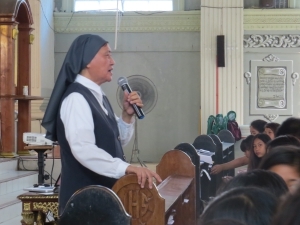 St. Francis Xavier Parish of Nasugbu, Batangas in coordination with the Daughters of Mary Immaculate (DMI) organized the three-hour symposium last August 31, 2018. Fifteen public and private high school principals responded to the invitation. 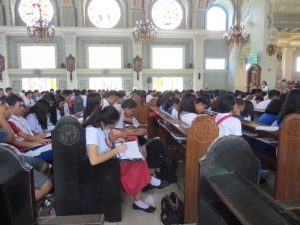 They sent selected Junior and Senior High School Student Delegates with their Teachers, a total of 250 participants. 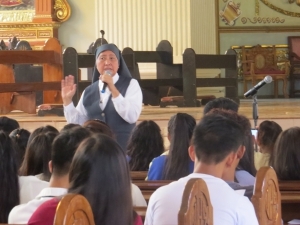 Attentive and showing interest for three hours with mini workshop in between three topics of the input, the main speaker Sr. Consolata Manding, FSP noticed the students taking notes and the teachers requested copy of the lectures to share to other students in their respective school. 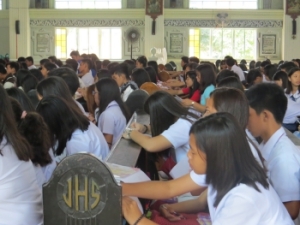 Expounding the dominant Media Culture that is created by the proliferation of media gadgets, easy access to online contents, and engaging nature of social media use, the speaker pointed out the benefits and also the dangers of over exposure to social media. To develop a critical attitude by becoming selective and analytical of media sources and its contents was highly recommended by the speaker with illustration on how it can help in our integral formation towards maturity. The participants wrote in their evaluation “lot of learning from the symposium” particularly the need for media diet, time management, and constant awareness of the good and the bad in social media, and its effects in our thoughts and behavior. The core curriculum of K11 and K12 in our educational system that started its implementation two years ago is Media Information Literacy (MIL), a combination of Media Literacy and Information Literacy. The participants, hopefully, got a clearer understanding of the concepts and principles of MIL, as mentioned by students’ evaluation. 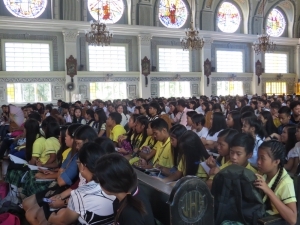 Due to the big number of attendees, venue was transferred to the Catholic Church of the Parish. The parish priest, Reverend Father Armando M. Lubis who also attended the symposium, expressed gratitude for the opportunity given to the youth.